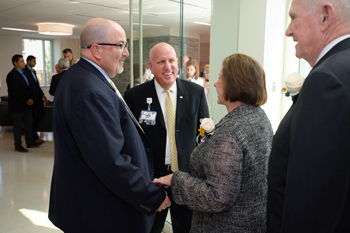 Captions - At top: Jeffrey Fried, President & CEO of Beebe Healthcare; Judy Aliquo, President & CEO of Beebe Medical Foundation, and Margaret H. and Randall Rollins, enjoy a moment after the unveiling of the historic gift. Above, left: Rick Schaffner, Executive Vice President of Beebe Healthcare and Tom Protack, Vice President of Development for Beebe Medical Foundation talk to Margaret H. and Randall Rollins following the event. Above right: Alex Moore and Anna Beebe Moore, grandson and daughter of the founders of Beebe, wait for the unveiling. Find out more about the planned expansion of Beebe Healthcare services in Sussex County. The Beebe Medical Foundation and Beebe Healthcare announced today a transformational gift of $10 million from the Ma-Ran Foundation to help fund improvements on Beebe Healthcare's Lewes campus as part of the Creating the Next Generation of Care services and facilities expansion plan. This gift represents the largest gift received by Beebe, the largest gift in Sussex County, and one of the largest gifts made in the state of Delaware. 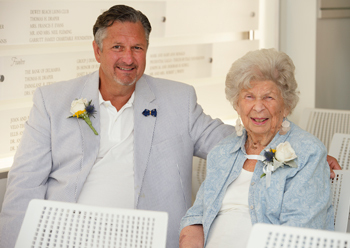 Peggy and Randall Rollins shared, "We are pleased to be able to contribute to this wonderful institution." The Rollins family has supported Beebe for more than 30 years with their loyal support. 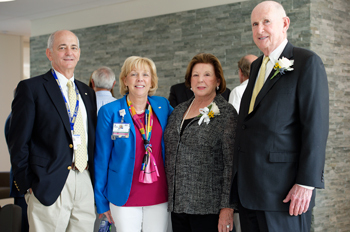 In 2011, R. Randall Rollins and Margaret (Peggy) H. Rollins donated $3 million through their Ma-Ran Foundation toward the expansion and naming of Beebe Healthcare’s Margaret H. Rollins School of Nursing, previously the Beebe School of Nursing. This project, completed in 2015, doubled the capacity of the school, and replaced the 50-year-old dormitory with a new three-story, 18,000-square-foot-building containing new, modern classrooms and clinical laboratories. Sussex County is one of the fastest growing counties in the nation. The population of the Lewes-Rehoboth area is projected to grow 9.2 percent in the next five years, higher than Sussex County at 7.4 percent growth rate, and much higher than the U.S. population at a 3.8 percent growth rate. Beebe Healthcare announced this proposed expansion in order to serve the growing community. For more than 100 years, Beebe Healthcare has served the Delaware Beach community and surrounding areas of Sussex County. As the community has grown, Beebe has also grown from a small family hospital into a large, state-of-the-art healthcare system.